Sometimes out of the blue a cat will stop using the litter tray or litterbox. You may notice early signs of this when your cat doesn’t dig into the litter, or goes into the tray and comes out without using it (Mills et al., 2013). Most owners just think “Oh, an accident!” and clear up. Then it happens again…. And again. Pet cats normally urinate 2-4 times a day and defecate 1-2 times a day (Overall & Dyer 2005). That’s a lot of times if it is not going into the litter tray! Persians seem particularly prone to difficulties in using a litter try (Bamberger, 2006). ACT NOW. Cats learn to feel a certain substance under their feet. For most cats this will be the litter, itself. But if (for some other reason) the cat has not been using the litter, it will start getting used to the feel of, say, carpet. And once carpet becomes the substance which triggers urination or defecation, you are in trouble. It’s no good hoping the cat will change its behaviour. You have to change the environment!! Never, never punish. If a previously litter trained cat starts house soiling, always check with the vet, in case your cat is ill. Trouble with the litter tray is very stressful for a cat. You have to work your way through ALL of these possibilities since you can’t ask the cat what is wrong with the existing set up. So try the most likely and if this doesn’t work, try the unlikely. What is unlikely to you may make perfect sense to your cat. Sometimes a cat who has been happy with the existing set up changes his mind. For example a cat that has been happy to share a litter tray with his companion cat now refuses to share. Or a cat that was happy to pee and poo in the same tray changes his mind. Do not assume that because yesterday’s set up was OK, it still is! So all “accidents” with litter need quick investigation and quick remedy. Do not use disinfectants in cleaning up. Disinfectant smells may prompt the cat to use the same site again. Use biological washing liquid followed by scrubbing with surgical spirit. Cats urinate on existing urination sites, so cleaning up thoroughly is very, very important. Do not skimp this. If none of this works, you may have an emotional problem and the cat is marking its territory! There is information on this website about this. Read Feline Marking – spraying or pooing. 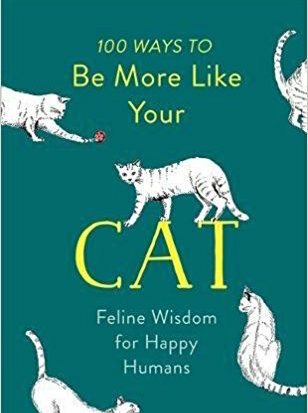 If that doesn’t help, get a cat behaviour counsellor. An outside person can often see what an owner cannot see. 1. DO YOU HAVE A LITTER TRAY? If you don’t, you must install one NOW. All cats, even those who usually go outdoors, need a litter tray. It’s no good expecting a cat to lead its life according to your standards. A cat that is urinating/defecating in the house may be afraid of doing it outside. So install a tray now. 2. IS THE LITTER TRAY LARGE ENOUGH? Bigger is always better. Minimum size should be one and a half times the length of a cat (Neilson 2009). 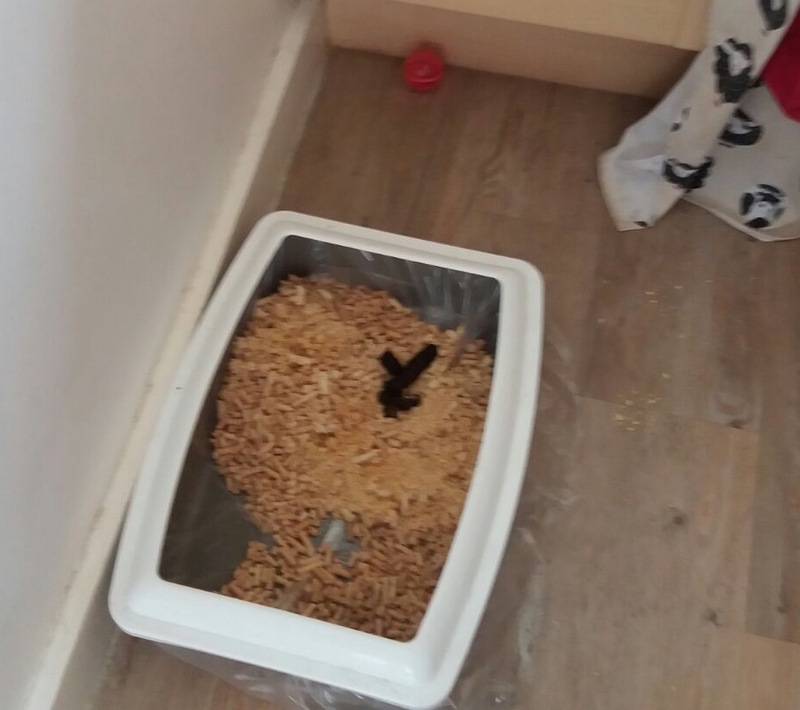 Don’t expect a full grown adult cat to use a small kitten litter tray. Cats prefer larger trays (Guy et al., 2014). Cats that have to hold back their urine, because there is no tray, can develop bladder stones or kidney disease. Some “giant” trays are nothing of the kind. Buy the extra large Trixie Primo cat tray which is 71 x 56 x 25 cms. 3. IS THE CAT SUFFERING FROM INJURY OR MUSCLE STRAIN OR ARTHRITIS? Get this checked with a vet. If so, it may not be able to reach the litter tray in time or be unable to cope with stairs etc (Caney 2007). Install extra litter trays in appropriate places it can reach. This may mean trays upstairs as well as downstairs, for instance, and not in rooms with slippery floors. 4. IS THE LITTER CLEAN ENOUGH? It must be cleaned daily, or better still twice a day. The cat may leave its bottom over the side because it doesn’t feel the box is clean enough. Some cats will tolerate a dirty tray. Others will refuse to use a tray that already has one lot of dirty material. Some cats have a higher standard of cleanliness than their owners! Sometimes a cat that has tolerated a dirty tray, stops doing so. So, if you really can’t clean twice a day, see if adding a second tray will solve the problem. (Neilson 2009). It’s not the odour: it’s the presence of the urine and faeces in the tray which puts them off (Ellis et al., 2017). 5. IS IT TOO CLEAN? Are you putting in deodorants, disinfectants or scented litter? Or have you started using a new cleaning fluid which your cat dislikes (Pageat 2007)? A litter tray should be dry and clean but with a slight aroma of urine and faeces – it should smell like a clean latrine. If you are cleaning the tray with disinfectants (not cloudy ones which are poisonous) remember to rinse it thoroughly so their scent disappears. Better still clean the tray with boiling hot water (Heath 2005). Don’t place one of those scented devices for humans (often used in lavatories) near the litter tray. Cats dislike overpowering scents and may refuse to use the tray. 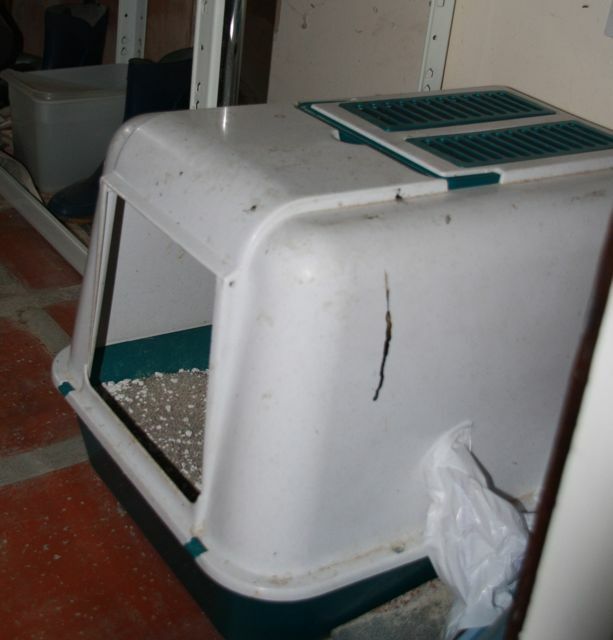 The noise of these devices, the “hiss” when they throw out the scent, will also put cats off. 6. IS THERE ENOUGH LITTER? There should also be enough litter for a cat to dig properly (Neilson 2009). Some cats will stop using the tray if you are too mean with the litter. Put in more. About two inches of litter is a minimum though some cats like to dig deeper. 7. HAVE YOU CHANGED THE TYPE OF LITTER? Change back. If you still want to change it, start by adding one handful of the new litter, then two – slowly changing over several weeks. 8. IS IT THE RIGHT LITTER? Offer several types of litter and see which is used. Then slowly change once the tray is being used (see above). In general cats prefer thin-grained litter to large grained (Neilson 2004). I use fine grained litter which is expensive. But it clumps well and works out not too costly because you can lift out the soiled area. 9. IS THE LOCATION RIGHT? Cats don’t like going where there is a busy thoroughfare or where there are worrying noises. Nor do they like urinating too close to food bowls or beds. A secluded place like a utility room, under stairs, broom cupboard, but away from noises either on stairs or from household appliances (Heath 2005). Don’t put the litter tray next to a noisy vibrating washing machine, for instance. 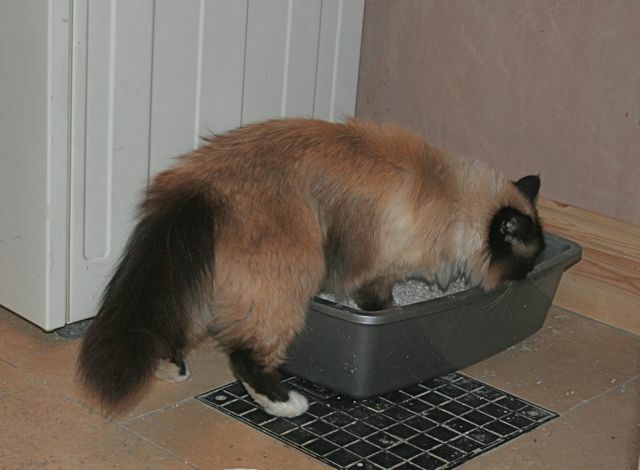 Some cats may also find it worrying if the litter tray is kept near a shower or lavatory, that are used while they are using the tray (Mills et al., 2013). Cats don’t like being overlooked by cats outside – ie if the litter tray is too close to patio doors where outside cats can look in or too close to the cat flap. If you are not sure, install another tray in a different location and if the cat uses this one instead of the original tray, only then get rid of the original tray. 10. IS IT THE RIGHT LITTER TRAY? If the problem is that the cat won’t use the litter tray (and therefore goes elsewhere) check that the cat is happy with this particular litter tray. Try putting down another one or some kind of temporary “tray” to see if a different one would be more acceptable. It may be that a new litter tray smells of plastic to a cat. If the new litter tray is unused, maybe transfer some material from the place the cat does go, into the tray. Cats prefer large trays to small ones ((Neilson 2008, Guy et al., 2014). The bigger the cat, the bigger the tray should be. The minimum size should be one and a half times the length of the car. 11. 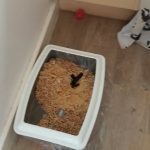 HAS YOUR CAT HAD AN UNHAPPY EXPERIENCE WHILE ON THE TRAY? Has your cat experienced ambush by a companion cat, ambush by a dog, pain, stomach pains while eliminating (from diarrhoea? ), human interference while using the tray, a sudden loud noise while on the tray, pain from cystitis, recent illness of any kind, recent trip to vet for something which seems unconnected with litter tray pain but might be. If so, the cat may mistakenly decide that the tray isn’t safe any more or the tray caused the pain. Therefore, experiment with a new (yes, new- don’t be mean – you can use a baking dish if you don’t want to shell out) tray. 12. IS YOUR CAT USED TO DOING IT OUT OF DOORS? For an outdoor cat (whom you want to be an indoor going cat) transfer some soil/sand from where they go. The familiar smell may trigger use. Some cats will use potting compost or peat, rather than other litters. Add some soiled material so the tray smells like a latrine. This is worth trying even if your cat has used litter in the past – it doesn’t cost much to put some soil in a tray. 13. DOES YOUR CAT DISLIKE USING THE SAME TRAY FOR BOTH PEE AND POO? Add a new tray so that it can urinate in one and defecate in the other. Odd but some cats definitely prefer this. Some cats that were OK about peeing and pooing in the same place change their minds about it. Just putting two trays side by side may not work. Cats may need two separate locations. 14. ARE TOO MANY CATS USING THE SAME TRAY? There should be one litter tray per cat and one over and trays should not be side by side. Some cats won’t go in the same place with other cats. A tray for each cat and one over makes extra sure. A new cat, which was occasionally urinating upstairs outside the tray, stopped doing this when an upstairs tray was installed, as well as a downstairs one. Always worth trying an extra tray – just in case. Place it in a different location to the others. 15. IS THE CAT FRIGHTENED ON ITS WAY TO THE TRAY? In a multi-cat household a bullied cat may be being ambushed while on the tray. Add trays where the cat can reach them without having to pass through enemy territory. It’s unkind to make a cat run the gauntlet of its enemies to get to the litter tray. That’s why you need a litter tray for each cat and one extra in different locations. 16. DOES THE CAT NEED A COVERED OR AN OPEN TRAY? Offer a choice. 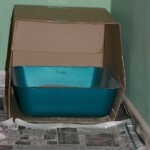 Experiment with a cardboard box, one that fits over the litter tray as a cover. If this helps, then buy a litter box with fitted cover. Use the same kind of litter and place some of the soiled litter in the new box, just so that it smells right to her. Some cats prefer see-through hooded trays to opaque ones, particularly in multi cat households. Some prefer opaque hoods. Some cats don’t like covered trays at all. (Neilson 2004). Hooded trays are difficult if one cat is ambushing the other. 17. IS YOUR CAT FINDING IT DIFFICULT OR PAINFUL TO CLIMB IN? 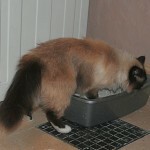 Arthritic, elderly or injured cats may need a shallow tray (Caney 2007). Arthritic cats, like arthritic humans, need pain relief. Some garden centre/DIY shops stock bases designed for holding plant pots/grow bags: they come in a range of sizes and there quite large rectangular ones with solid bases that hold several large plant pots, and the rims are about 1” high. Or take very strong scissors and cut away the front of the litter tray. 18. DOES YOUR CAT HAVE CYSTITIS OR SOME OTHER ILLNESS? Cystitis symptoms include straining, pain when urinating, blood in urine, frequent urination, urinating in the wrong place, lots of tiny urinations instead of several large ones. The pain may make the cat dislike the litter tray or the need to go so often means it cannot get to the tray in time (Gunn-Moore 2002). Sometimes cats with cystitis go in multiple places because they use a place, experience pain there, and feel they must find a new place. More common in long haired, overweight, neutered males. Diabetes, kidney problems or any illness which involves lots of drinking may also result in urine outside the litter tray. Geriatric confusion can also lead to litter tray difficulties (Bowen 2010). 19. IS YOUR CAT HANGING HER BOTTOM OVER THE SIDE OF THE TRAY? Make sure the tray is full enough, large enough and clean enough. Even so some cats dig furiously but leave the backside out of the tray!! Try placing a smaller tray inside a larger one with a gap of about two and a half inches at the entrance. 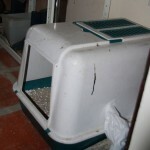 This ensures that the cat has to step across the gap to enter and use the inner try. Any overspill is absorbed by a small amount of litter in the gap area. The other idea is simply to buy a large deep round washing up bowl or a potting tray and use it instead of the conventional litter tray. “Our cat, Mitzi, was unable to get her tail over the side. It had other advantages in that a washing up bowl was easier to lift with its rounded rim and easier to keep clean” reported Mitzi’s owner. 20. IS YOUR CAT SCATTERING LITTER EVERYWHERE? Some cats dig deep and long and litter goes everywhere. 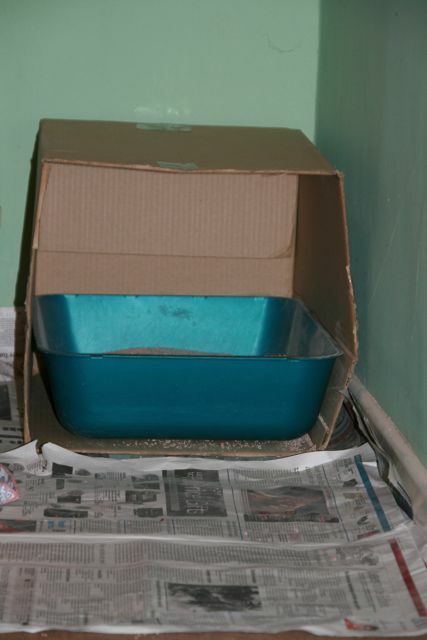 If you are not already using one, install a hooded large litter tray or place the tray within a large cardboard box. Next, if you are using a light litter, change slowly (see above) to a heavier brand so that less will fly around. 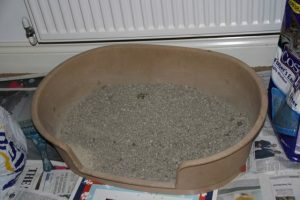 Finally, if all else fails try this: http://www.clevercatinnovations.com/top_entry_litterbox_order.aspx It will only work for a reasonably athletic young cat. 21. ARE YOU CLEANING UP CORRECTLY? Cats will pee and poo in areas that smell of pee and poo. If you are using disinfectant or scented cleaning products to clean up, these smell of urine to cats. Read the article on How to Clean up Cat Pee on this website. VIDEO ON LITTER TRAY TIPS here. NOTE. Using Feliway Classic, while appropriate for cats that are marking their territory with urine, can be counter productive if the cat is merely having trouble with its litter tray. Bamberger, M. & Houpt, K. A., ‘Signalment factors, comorbidity, and trends in behavior diagnoses in cats: 736 cases (1991-2001),’ Journal of the American Veterinary and Medical Association, 22, 1602-1606. Gunn-Moore, D. A. (2003), ‘Feline lower urinary tract disease,’ Journal of Feline Medicine and Surgery, 5, 133-138. Guy, N. C., Hopson, M. & Vanderstichel, R., (2014), ‘Litterbox size preference in domestic cats (Felis catus),’ Journal of Veterinary Behavior, 9, 78-82. Mills, D., Dube,, M. B. & Zulch, H., (2013), Stress and Pheromonatherapy in Small Animal Clinical Behaviour, Chichester, UK, Wiley-Blackwell. Neilson, J. C. (2008). ‘Is bigger better?’ litterbox size preference test.’ Proceedings, ACVLB/AVSAC 2008, Scientific Paper and Poster Session, 46-49. Neilson, J. C., (2009), ‘House soiling by cats’, in eds Horwitz, D. F. & Mills, D. S., BSAVA Manual of Canine and Feline Behavioural Medicine, Second Edition, Quedgeley, Gloucestershire, BSAVA, 117-126. Overall, K. l., & Dyer, D., (2005), ‘Enrichment Strategies for Laboratory Animals from the Viewpoint of Clinical Veterinary Behavioral Medicine: Emphasis on Cats and Dogs,’ ILAR Journal, 46, 202-216.